This was a big hit at Carroll Cafe a couple weeks ago. Frittatas are a great egg dish that are extremely versatile and perfect as breakfast, lunch, or dinner. They’re a great way to get your protein and add any vegetables you have lying around as well. For this sandwich I incorporated some greens I’d received in my CSA, as well as some roasted sweet potato. I really enjoyed the sweet potato in this because it added a creamy, slightly sweet note to an otherwise savory dish. But you can really add whatever vegetables sound good to you. Because I knew I was going to use this to make open-face sandwiches I didn’t add cheese to the frittata, but cheese is another great addition. Since this is a very simple recipe make sure you’re using ingredients you like. It’s worth splurging on good bakery bread and your favorite cheese since each ingredient is really highlighted in this. Served with a simple salad, and/or a bowl of soup, and you have a hearty, easy meal. Preheat oven to 400°F. Grease a large baking sheet and a 9×13″ pan with cooking spray. Toss the sweet potato with the olive oil and a sprinkle of salt, and spread in a single layer on the baking sheet. Roast for about 35 minutes, or until tender and beginning to brown. Layer the prepared 9×13″ pan with the greens and the roasted sweet potatoes. In a separate bowl, whisk together the eggs, egg whites, milk, salt, pepper, and herbes de provence. Pour the egg mixture over the vegetables. Give a little stir, so that all of the vegetables are covered with liquid and everything is in an even layer. Reduce heat to 350°F and bake for about 30-35 minutes, or until set. If the frittata begins to brown too quickly, cover with foil. Let frittata sit for at least 5 minutes before slicing into 12 pieces. 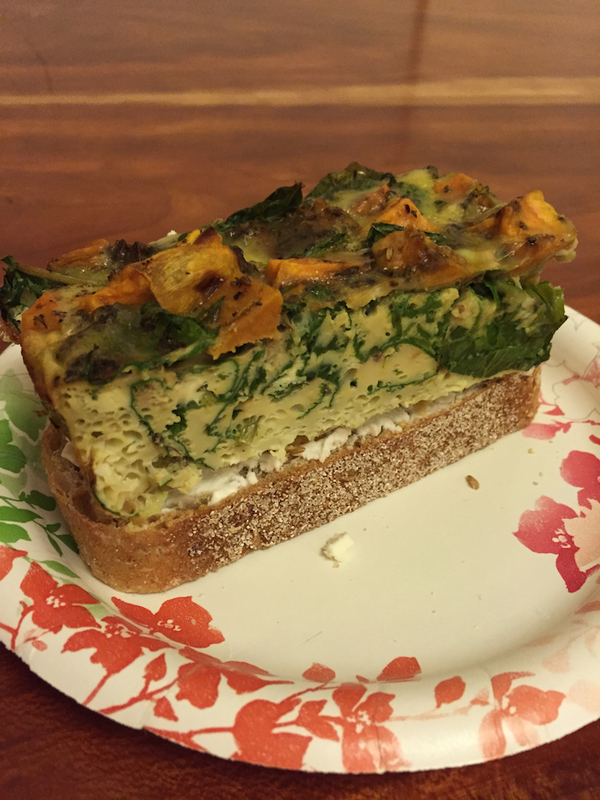 Spread goat cheese onto bread and then top with a slice of the frittata. Serve warm or at room temperature.